In this article we will see how to acquire a ReentrantLock in an interruptible and non-interruptible mode. When a thread fails to acquire the lock, it gets added to a waiting queue. It can be unblocked either by the thread holding the lock or by interrupting it. When we call ReentrantLock.lock(), we acquire lock in a non-interruptible mode which means even if the thread waiting in queue is interrupted or unparked, it is going to simply retry acquiring the lock. This goes on, resulting in blocking and unblocking of the thread till it acquires the lock. We can try acquiring lock in exclusive interruptible mode using ReentrantLock.lockInterruptibly() in which case if the thread in waiting is interrupted by some other thread it will result in InterruptedException thus there won’t be any retry. 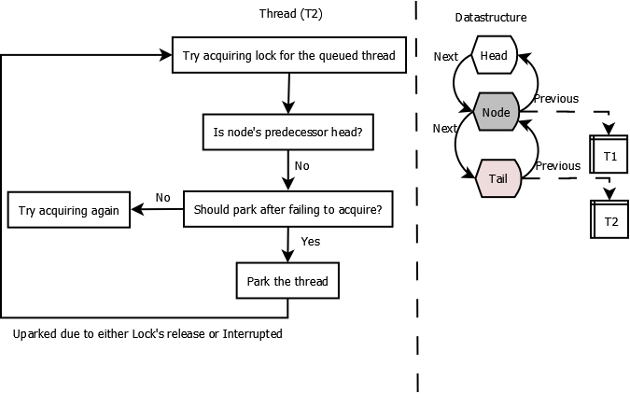 If the thread is unparked as a result of release of lock then it is going to retry acquiring lock. AcquireLockRunnable acquires lock in either interruptible or non-interruptible mode based on the parameter passes in to the constructor. Once the thread acquires the lock, it sleeps for few seconds and releases the lock in the finally block. The first thread that acquires the lock, holds the lock a bit longer than the other threads so that the threads trying to acquire gets added to the queue. In our first example, we acquire the lock in an interruptible mode. In method lockAndInterrupt(), we start multiple threads. Each thread tries to acquire the lock. After the first thread is created and started, we sleep for couple of seconds so that the first thread gets a chance to acquire the lock. We pass an instance of AcquireLockRunnable as the Runnable. We then start the other threads which end up waiting in queue till they acquire the lock or are interrupted. Once all the threads are started, we interrupt threads in the order in which we have started. You can see from the below output, ‘Thread(1)’ acquires the lock first and remain threads try to acquire but fail till the first the thread doesn’t release the lock. Moment ‘Thread(1)’ release the lock, ‘Thread(5)’ ends up acquiring the lock as ‘Thread(2)’, ‘Thread(3)’ and ‘Thread(4)’ were interrupted which results in java.lang.InterruptedException so they no more contest for the lock. ‘Thread(5)’ is interrupted and then it releases the lock which is then acquired by ‘Thread(6)’. I our next example, we acquire the lock in a non-interruptible mode which is the default mode. As you can see below, even though the threads are interruptes, it doesn’t result in java.lang.InterruptedException, instead they simply try again to acquire the lock. This was an example about interrupting a thread trying to acquire a ReentrantLock.